Just how big is the IPv6 address space? 340,282,366,920,938,463,463,374,607,431,768,211,456 addresses to be exact. 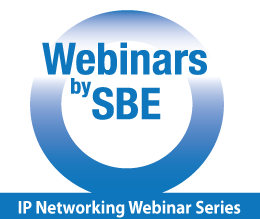 Hear more about IPv6 during the Webinar by SBE on IP Networking, part 4 – IPv6, taking place February 21, 2013. Just as IPv4 addressing can be challenging when managing limited IP address space, IPv6 brings new challenges when working with enormous IP address space. A new mindset is required to effectively understand and implement IPv6 in your network. New IPv6 features and capabilities also bring challenges to the broadcast network engineer. Follow us on Twitter @SBEorg, #webinarsbysbe and post your questions for the webinar presenter, Wayne Pecena, CPBE, 8-vSB, AMD, DRB, CBNE. You can also post your questions on our Facebook page. This webinar is the fourth in a series that aids in the self-study for the SBE Certified Broadcast Networking Engineer™ (CBNE™) certification exam. Just as IPv4 addressing can be challenging when managing limited IP address space, IPv6 brings new challenges when working with enormous IP address space. This webinar, which takes place on February 21, 2013, builds upon the brief introduction to IPv6 terminology presented in the third webinar of the series held in January 2013. A new mindset is required to effectively understand and implement IPv6 in your network. New IPv6 features and capabilities also bring challenges to the broadcast network engineer. TWiRT is a weekly podcast that reviews current news, commentary, ideas, fun, and tips to help broadcast engineers.